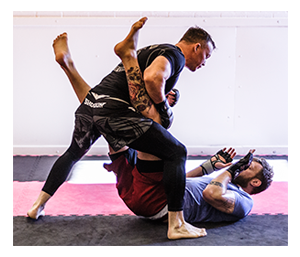 Mixed Martial Arts is a full contact combat sport, known also as cage fighting or ultimate fighting; class training with Andy Wilson (Pro Fighter) offers a breakdown and learning environment for students of the sport. The main features of MMA are its exciting combination of striking and grappling techniques from standing or seated or ground positions. MMA workouts offer an excellent session, a lot of fun and a great way workout learning all the skills and drills and if you’re really good, it might even be a career. If you’re interested and keen on giving it a try come on down. Our onsite shop stocks MMA gear, pop in for a look. Beginners are always welcome.